"Without trucks, America stops." -- American Trucking Association. That quote precisely explains why no investor can ignore the trucking industry. With trucks moving 69% of total U.S. freight tonnage today, the industry often serves as a leading indicator of the state of the economy. So holding some trucking stocks could be a great way to play economic upturns (Basic facts surrounding the trucking industry can be found here). The U.S. trucking industry pulled in $700 billion in revenue last year, its highest ever. Trucking alone made up 80% of the nation's total freight revenue in 2014, proving trucks remain the preferred mode of transportation. The ATA truck tonnage index hit an all-time high in January. While truck tonnage has softened over the past couple months, the index was still up 3.8% through April versus last year, indicating overall strength. Now that you have a fair idea about the trucking industry, here are two great stocks to consider. A Fortune 500 company, Paccar is one of the largest truck manufacturers in the world. Through well-known brands including Kenworth, Peterbilt, and DAF, Paccar has established solid presence in global truck markets, particularly in the key heavy-duty segment. The following chart shows how Paccar's market share in important heavy-duty truck markets has grown over the past decade. Source: Paccar Q1 2015 investor presentation. As you can see, Paccar has cornered at least a quarter of the heavy-duty truck market in the U.S., Canada, Mexico, and Australia. Meanwhile, its DAF brand is making good headway in Europe, commanding nearly 14% share in 2014. Paccar is deftly exploiting its strong foothold in the truck markets: Its revenue surged 11% to hit an all-time high of nearly $19 billion last year, and net income climbed 16% to $1.36 billion -- the second-best figure in the company's history. What could really set Paccar apart from traditional truck manufacturers is an increasing focus on manufacturing its own engines. While the company still sources majority of its engines from Cummins (NYSE:CMI), self-reliance is among its primary goals. The progress is already visible: Paccar's MX-13 engines made their way into 37% of its Kenworth and Peterbilt heavy-duty trucks in the fourth quarter. The company is now gearing up to launch its 11-liter engine in North America by early next year. Well-planned strategic investments have helped Paccar generate a 9.5% return on invested capital on average over the past four years, with return on equity topping 20% currently. The company has paid a dividend every year since 1941. In a nutshell, industry leadership, strong financials and shareholder returns, and aggressive growth plans make Paccar a compelling story. Cummins is not building trucks, but it supplies essential components without which trucks would not run, such as diesel and natural-gas engines, filtration, and fuel systems. The company thus caters to the key supply side of the trucking industry. Cummins is among the world's top engine makers, having gained solid traction over the years. For perspective, it commanded one-third of the heavy-duty and a staggering 80% of the medium-duty truck engine markets in North America in its last quarter. Its share in the high-potential Chinese market grew to 17% in the first quarter from 11% a year ago. Cummins' engines are sought-after worldwide, largely because of the "fit-for-market" strategy under which it designs and customizes engines and components to suit a region's specific requirements. That notably addresses region-specific emission standards. Furthermore, through its long-standing joint venture with natural-gas engine technology expert Westport Innovations, Cummins is well positioned to cash in on growing demand for the alternative fuel. CMI Total Long Term Debt (Annual) data by YCharts. 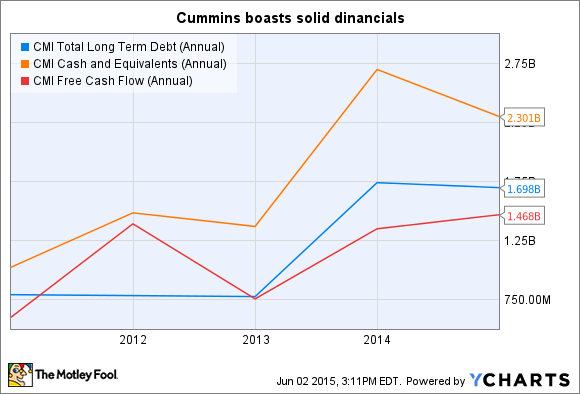 A good chunk of that free cash flow goes into shareholders' pockets: Cummins has increased its dividend by threefold since 2010, including a 25% boost last year. The company also announced a fresh $1 billion share repurchase program last year to top an existing $1 billion buyback program. Cummins' return on equity topped 20% in 2014. Overall, Cummins comes across as a finely managed and fundamentally solid company that has what it takes to reward patient investors handsomely in the long run.